InNews Magazine creates monthly online textbooks that focus on teaching conversation strategies and skills, whilst learning about the most current and global news stories. As a learning aid, InNews features YouTube videos, online smartphone vocabulary games and learner collaborative internet research based homework. Our magazines and textbooks aim to create a wholly student centered communicative learning environment which focuses on ‘what’ the students are trying to say rather than the ‘how’. Our magazines are available online and it can be accessed by teachers or students on a smartphone, tablet or PC. 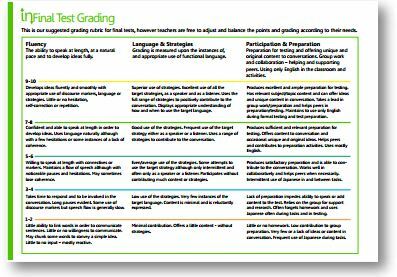 Printable PDF copies can be downloaded from the website for classroom use if required. 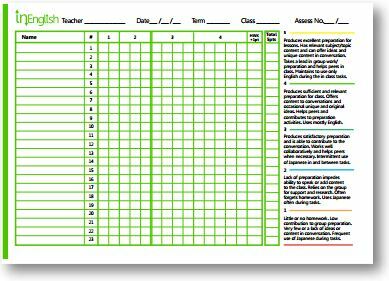 In the classroom, the InNews lesson staging can be easily followed or adapted according to student ability levels - only a projector/screen and a PC is needed to use the online textbook and lessons. To learn more about our different courses and decide which is best for you and your students - please visit our ‘Programs’ page. If you want to try any of InNews Magazine's programs or have any feedback for us, comments, or ideas -please contact us at info@innewsmagazine.com. Our programs are all about the fundamentals of English communication and conversation. 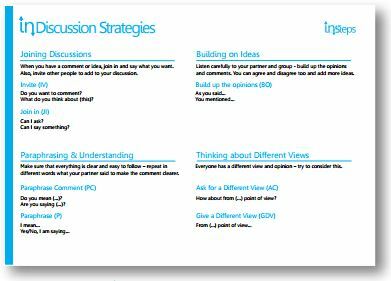 Throughout the year we focus on a range of ‘Conversation Strategies’ and how to use them around a variety of current global news stories. InNews Magazine and our programs help students to become more globally aware by encouraging the learners to discuss, think and share ideas about the world, its people and its cultures. InJuniors is a textbook for the Junior High School Classroom which focuses on and presents speaking ‘strategies’ to younger learners, moreover grammar and vocabulary. InJuniors features two CALL classes per semester with Kahoot games and animated videos. Over one year of studying with inJuniors students will be able to engage in longer conversations and start to express their ideas and opinions on topics which are current and meaningful to them. 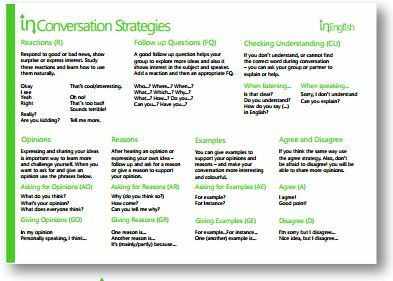 Every month InNews features a different ‘Conversation Strategy’ - from how to join a conversation and express an opinion, through to supporting your ideas and offering reasons. These basic communicative skills enable the students to gain confidence to take part in longer, extended conversations. Building upon and continuing from the 1st year, the InSteps program further expands upon the ‘Conversation Strategies’ the students have already studied and have put into practice. The class refocuses on ‘Discussion Strategies’ on variety of current and topical global issues - delivered in a meaningful context. By the end of the course we expect students to better able to not only use English in collaboration and task preparation - but also in face to face conversation and extended discussions. The courses and online magazine offer students a unique opportunity to think critically and to become more internationally aware of current global issues. Such skills, we hope, will ready learners for further academic challenges ahead at university and also beyond in the workplace. 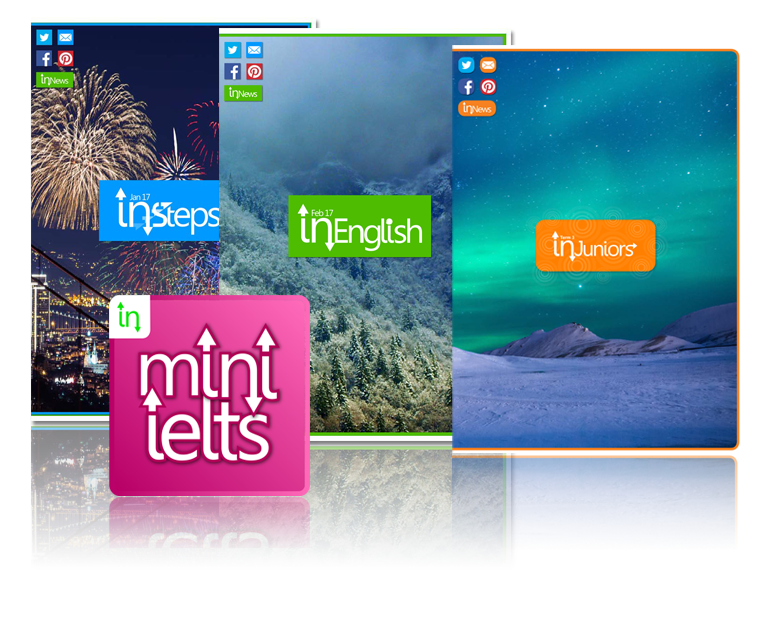 Mini IELTS is a unique app that provides a real time simulated IELTS speaking test. Challenge and practice your speaking skills. The lite app features only 3 topics to practice with but the full premium app features 30 random topics so you can experience a realistic test experience and practice all your way to the test centre. The premium app also lets you playback and download your effort to review later or to show to a teacher. Available on IOS and Android. Download it now and try for yourself! 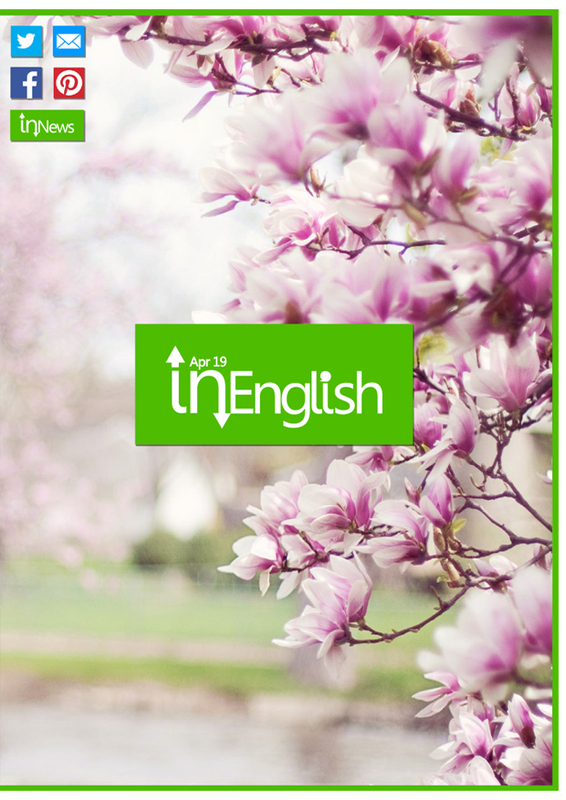 Here you can access the past issues of the InEnglish and InSteps. These issues are password protected so to access them please email us at info@innewsmagazine.com. Here you can download the ‘Conversation Strategies’ for the InEnglish program and the ‘Discussion Strategies’ for the InSteps course. 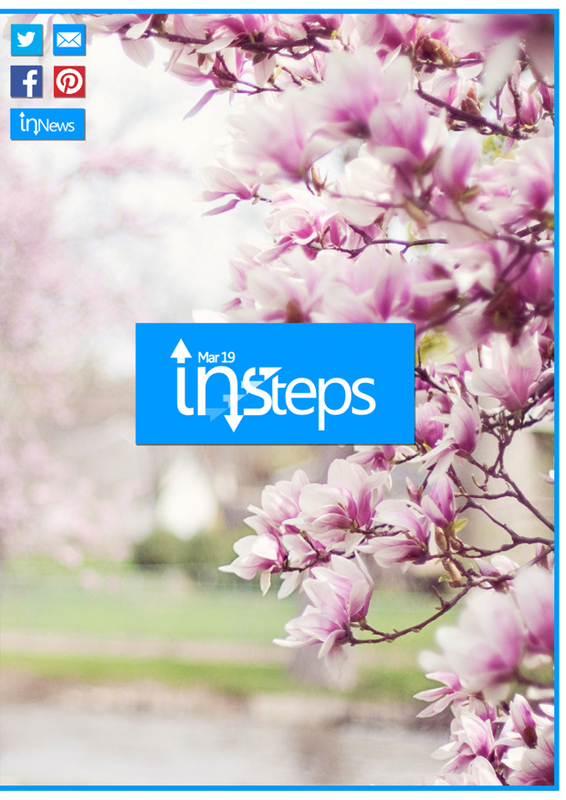 All past issues of InNews Magazine are available for download and use. From April 2016 – InNews Magazine is password protected. Click on the links below to download our magazine PDF's from 2017. Click on the links below to download our magazine PDF's from 2016. Below you can access some useful links for you and your students. These will change from month to month so check here every month! 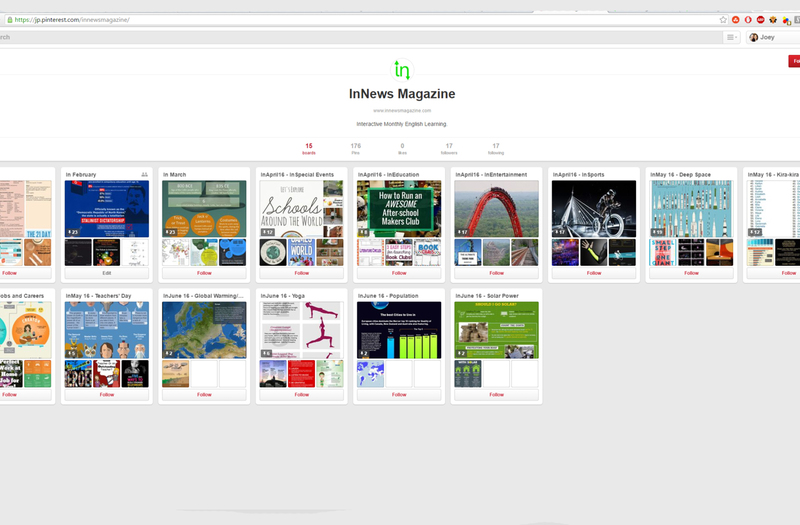 Our pinterest site is a great place to assist you with your monthly studies. 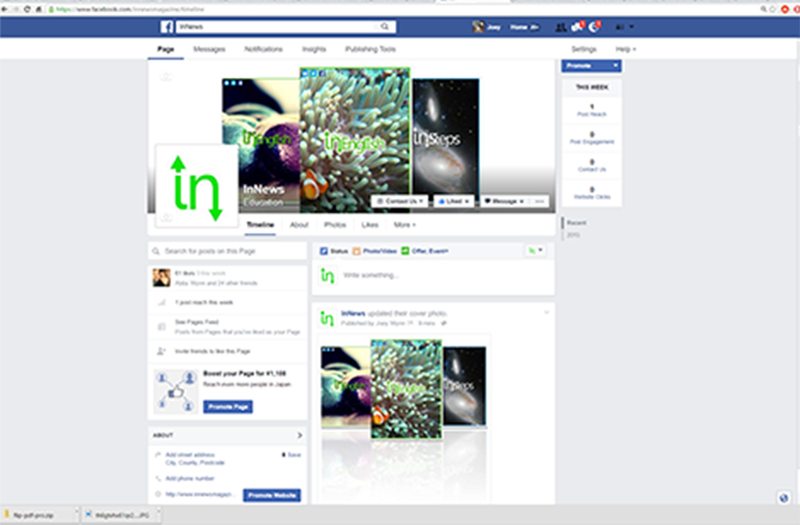 Like us on Facebook to keep up with our latest posts. 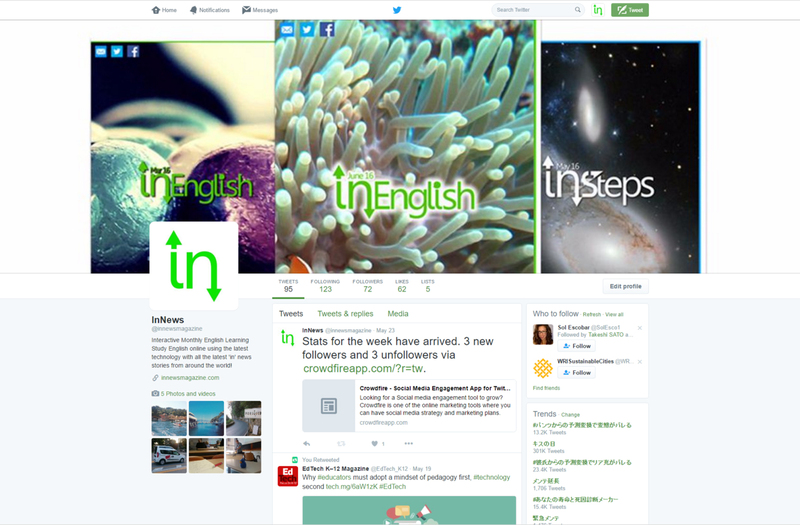 Follow us on twitter for all the latest in edtech from around the world. For more information on InNews Magazine and the programs that we offer please don't hesitate to contact us using the links or form below. For information regarding our textbook prices and subscription options or any other information or help please contact us via email.